Which Tel Aviv Beach To Visit? Wondering which Tel Aviv beach to visit? Should you stick to the beach near your hotel, or try another one? All of Tel Aviv's beaches are stunning, yet each one has its own special ambience which attracts a different crowd. This page covers the southern beaches of the city, starting from the Hilton Beach and continuing southwards. In Fall in Love with Tel Aviv Beaches, you can discover Tel Aviv's northern beaches. Hilton Beach is one of the most popular beaches in all of Israel. Hof Haklavim is a pretty narrow Tel Aviv beach strip. This is where man's best friend can enjoy the sea and sand and run around unleashed. Such fun! Sometimes called “Atzmaut” (Independence) Beach, named after the cliffs of Atzmaut Park just above, this beach is gay-friendly. Everyone is welcome at all times, but on summer weekends and especially for a few weeks before and after Gay Pride Parade in June, the beach is mainly for gays. You can find out more about Gay Tel Aviv Israel Events HERE. Hilton - Surfer’s beach is a world class surfing site, but is great for non-surfers too. Take a look at this video of the Israeli Triple Diamond Strongman Surfer’s Competition that took place here at the Hilton Surfer Beach. There’s a wide breakwater in the middle that divides this Tel Aviv beach into two separate bays. Surfers go out on both sides of the breakwater, summer and winter. You can walk along the breakwater path. The right of the breakwater leads to TopSea, one of the longest running surfing, kayaking and paddle boarding schools in Israel. On the left you can go have a drink or a snack at TopSea Beach Bar-Restaurant. The location is superb and seating is very comfortable on outdoor ‘sofas’. Just note, it’s not cheap. North of the breakwater and further out is an area characterized by ‘tricky’ waves, that are less strong, but more 'interesting'. South of the breakwater are the ‘deep’ waves that are longer and stronger. Just north of the breakwater, the sea is quite shallow and the sand is super-soft. This is a perfect spot for families with young children. Just stay clear of the surfers and kayaks nearby pushing out to sea. South of the breakwater leading to the Tel Aviv Marina is a really nice beach. Lots of local celebs come to see and be seen there, or just to relax. 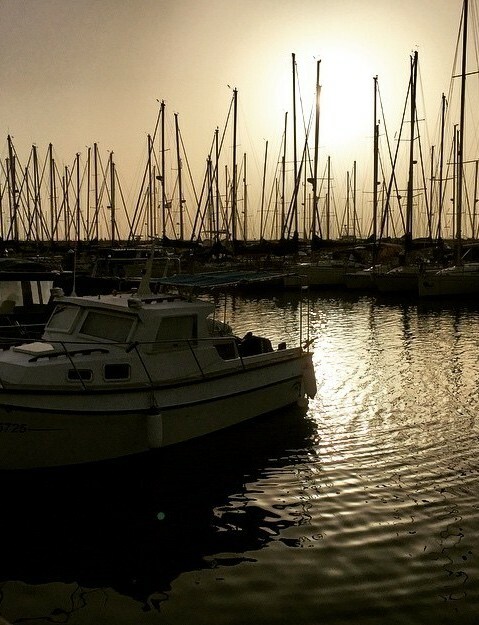 South of the Hilton Beach is the Tel Aviv Marina. It's quite pretty to see the boats docked here. From the marina, you can dive or rent surfboards, windsurf board or even book yacht for a few hours to sail, fish or have a party onboard! Each of these three Tel Aviv beaches are lovely with a wide sandy area. You can sunbathe, frolic in the sea, or play volleyball and 'matkot' - which is Israeli's favorite beach sport - two players, two wooden racquets and a small black ball. During the summer, they are packed with tourists since they are in the center of Tel Aviv's hotel strip. The Tel Aviv Promenade in this area is lined with lots of bars, restaurants and ice-cream parlors which serve on the beach itself. Frishman Beach is home to the Calypso Restaurant on the beach, run by a well-known Israeli chef. But don't expect a chef restaurant - its more of the typical Israeli beach food fare. Gordon Beach is right near the well-known Gordon salt water pool and outdoor gym. For you history buffs out there, it was at Gordon and Frishman Beach that British gunboats fired on and beached the illegal 'Aliya Bet' ship Tiger Hill in 1939. 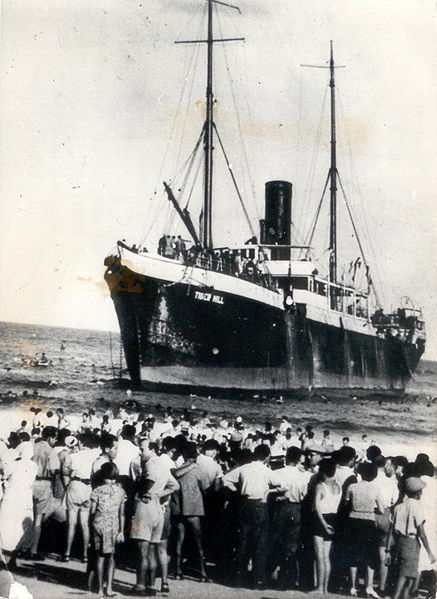 About 750 exhausted and and desperate Jewish refugees escaping Nazi Europe were fired on by British gunboats. Local Telavivians rallied to help them. After two were killed the rest were arrested. 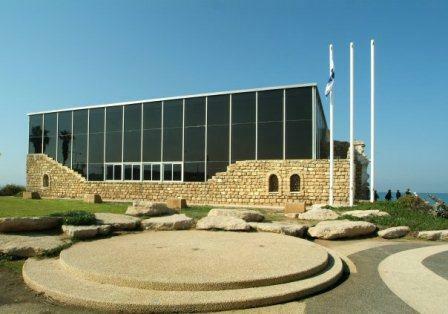 Read more about the amazing, modern history of Tel Aviv. 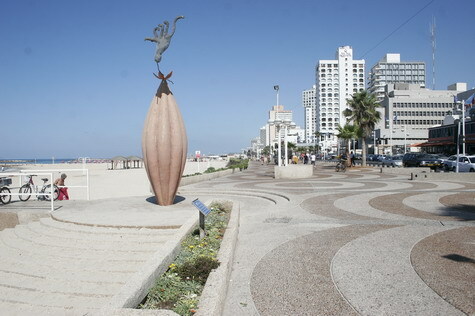 South of Bograshov beach, you can spot Trumpeldor beach by the unusual statue on the promenade right above it. Trumpeldor beach is quieter than its neighbors since it is ‘undeclared’ - meaning there are no lifeguards and facilities. So you can expect less people and lots more calm than on neighboring beaches. But please don't go swimming at any undeclared beach without a lifeguard. 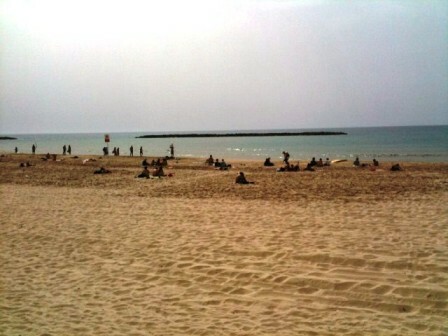 The Mediterranean Sea in Tel Aviv has strong undercurrents. 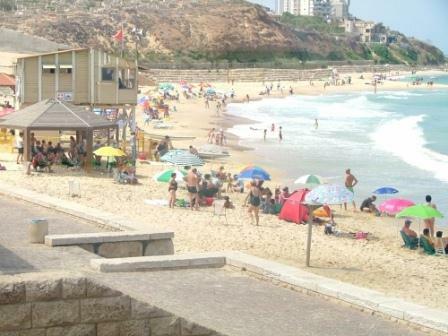 Jerusalem (formerly Geula) Beach is right off Allenby Street and near the well known Opera Tower building. Jerusalem beach tends to be bit less crowded than some of the beaches just north and south of it. Lots of name for this single beach that has a different atmosphere that every other Tel Aviv beach. There’s a special, tranquility here, especially further south. On the north, there is a water sports school for windsurfing, wave surfing and more. Southwards the beach has a distinct ‘bohemian’ flavor or ‘shanti’ style in Israeli slang. From there is the name 'drummers' beach. You'll find less hip locals and tourists, and a more relaxed crowd playing backgammon, reading a book or meditating on the beach. I recommend visiting the beach on Friday afternoons during the summer. 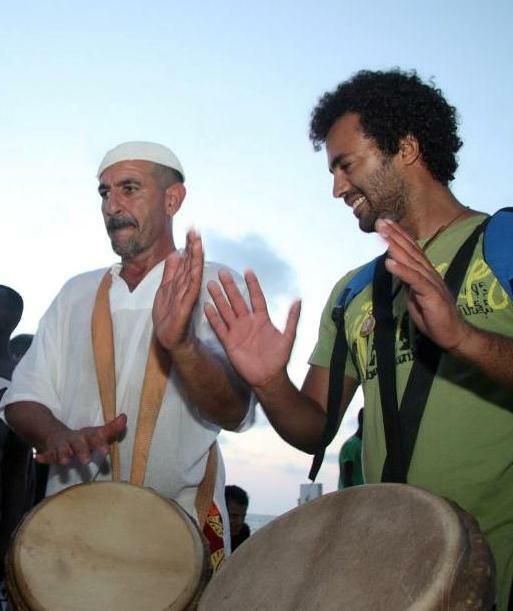 You’ll get to see the weekly drumming sessions on the rocks jutting out to sea. All around are dancers, jugglers and people doing copoeira. During the summer, stay for the evening at the Banana Beach restaurant/cafe which sets out tables and chairs along the beach. 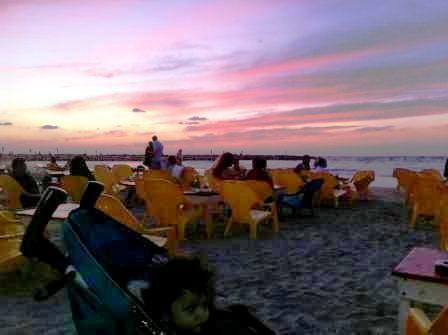 The food is typical beach-fare, but it’s nice to have a drink or good coffee and catch the gorgeous Tel Aviv sunset. On summer nights and sporting events, there is a large screen where they play free movies. Alma Beach (or Charles Clor Park Beach) is a long and narrow strip of lovely beach, green lawns and a playground to which lots of families come to have a barbecue. The northern half of this Tel Aviv beach is home to Manta Ray, one of the most romantic seafood restaurants in Israel, and a fantastic sea view which you can enjoy from indoors or the outdoor porch. Read more on our recommended favorite Tel Aviv restaurants. A few minutes from Alma beach is HaTahana - the Old Train Station. If you walk 5 minutes to the southern end of the beach from the Charles Clore park, there is another unofficial beach for dogs. It’s off the beaten track and worth visiting. commemorating Etzel, one of the 'infamous' paramilitary Jewish groups that operated during the British occupation of Palestine until Israel was founded in 1948. The building itself is a beauty, combining a modern glass structure on top of an original stone building from 1900. South of Alma Beach is Jaffa Port, a great place to walk around. Its much more authentic and less developed than Tel Aviv Port to the north. 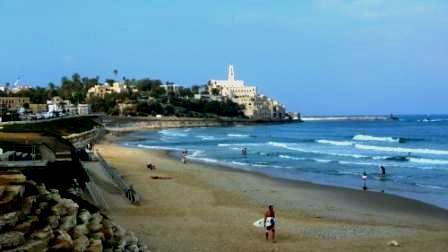 If you continue south, you will hit Gan Hamidron, Jaffa's main beach. It's a pretty beach on a small bay with a playground for kids. Because of the structure of the bay and the surrounding rocks, part of the sea forms a shallow pool which is very convenient for families with small children. 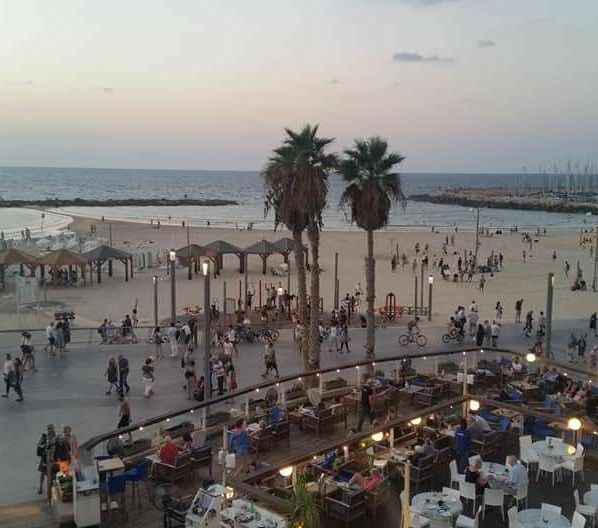 What's especially nice about Gan Hamidron is that its probably the only Tel Aviv beach (perhaps besides Alma Beach) where you can see both Arabs and Jews relaxing and enjoying the beach and the seashore together. So Which is YOUR Favorite Tel Aviv Beach? Do you have your own Tel Aviv Beach Story? 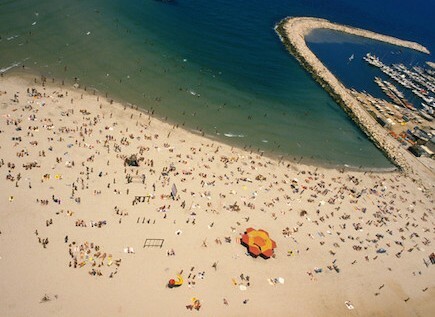 Which is your favorite Tel Aviv beach? Tell us why you picked it and add your own beach picture. Share your own personal story, tip or review on your favorite beach in Tel Aviv! Entering your story is easy to do. Just type it in. TIP: Since most people scan Web pages quickly, include your best thoughts in your first paragraph. Do you have some Tel Aviv beach pictures to add? You can include up to 4 photos. Click here to see the rest of the form and complete your Tel Aviv beach story. 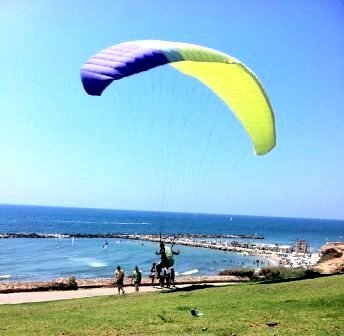 "Click on the links below to see some Tel Aviv beach tips, stories and reviews written by other visitors to this page.